Beer for a Year, month six… – Who Eats Like This? Being a huge lover of food, I think about it constantly. What I want to eat, what I am actually making to eat (sometimes the two don’t match) and what others are eating…I am obsessed! Seriously, it drives me crazy, because I am always hungry! This month’s post has been on my mind, not because it’s just food, but because it’s one of my ultimate favorite things to eat. But, it’s also one of those simple dishes that I am bittersweet about. Not just because of the fat factor. No, I won’t be skimping on the ingredients in this post, so don’t even think about the calorie count. 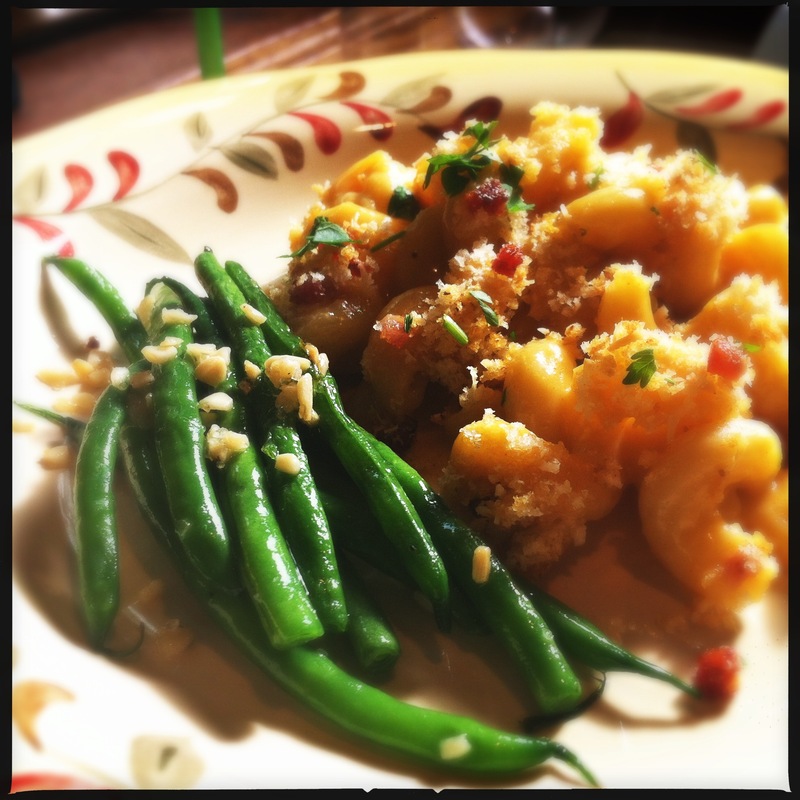 But also because a really good, homemade Mac & Cheese has always eluded me in my kitchen. I either over cook the noodles, which results in mush, or the sauce is too thin going into the oven so that when it comes out, it’s dry. You’d think homemade Mac & Cheese would be a no-brainer! Well, maybe it is for some and maybe because it’s one of my cherished foods, I tend to over think it. Either way, today, I am going to ROCK this Mac & Cheese!! I have big plans for it, starting with the fact it will include BEER! Yes! 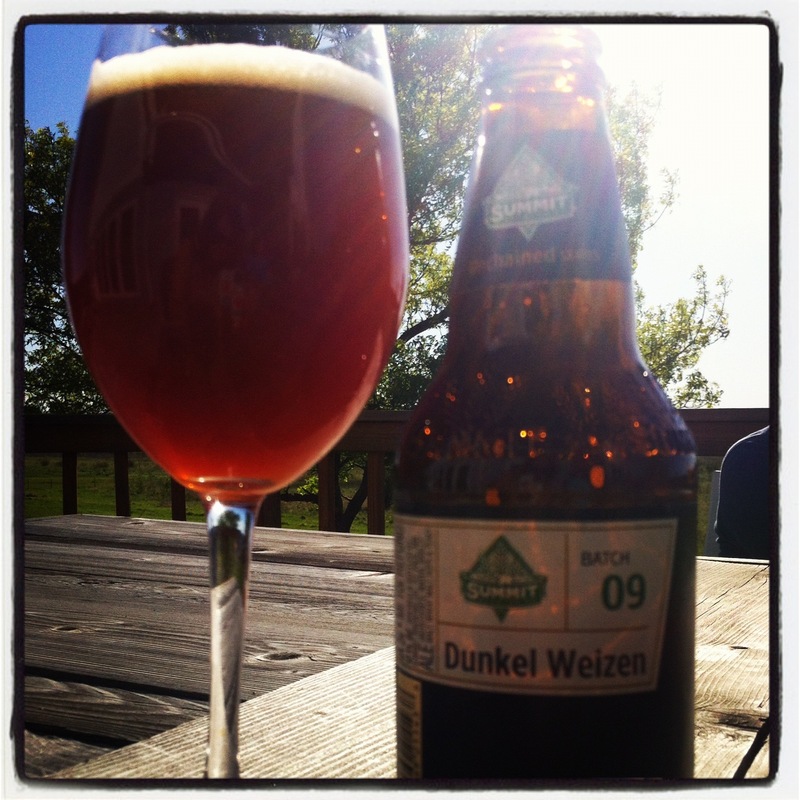 And, this month, Summit Brewing gave me a special treat; Dunkel Weizen! Let’s talk about it! I found this recipe on this website; www.livelovepasta.com I am always searching for recipes with beer and was excited to find this one! Of course I kicked the original recipe up a bit…. (Truffle Oil, Pancetta & Garlic) but that’s what is great about pasta dishes, you can make it your signature dish! Start by preheating your oven to 375 degrees and getting your pasta water ready on the stove. Remember to cut back the cooking time of whatever type of pasta you use by 1-2 minutes, as it will continue to cook in the oven. Cook according to package directions. Drain and set aside. 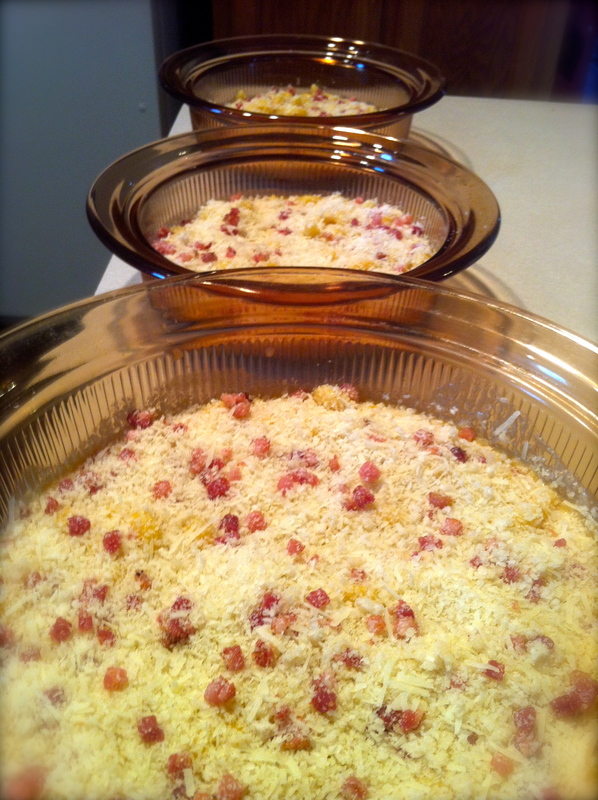 At this time, I like to get all my cheesy goodness ready……including the Panko topping. 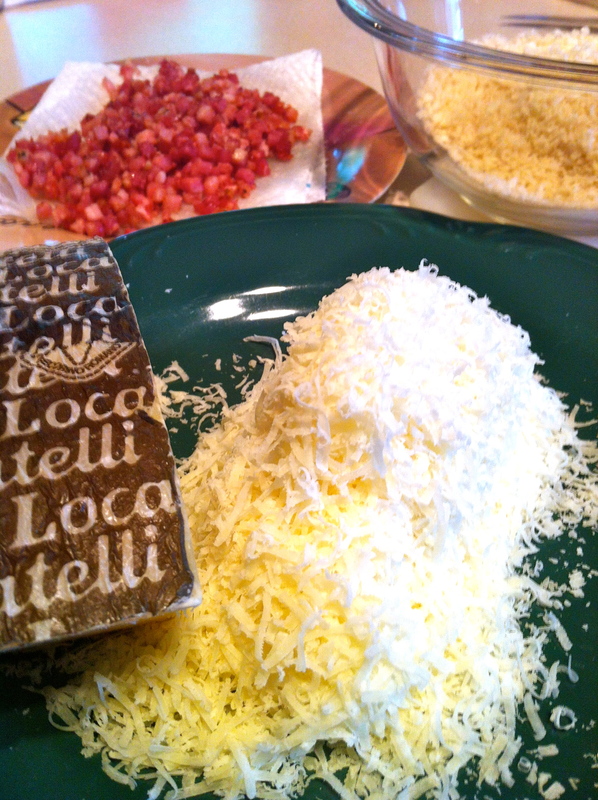 Mix together the Panko, Garlic, Romano cheese and Pancetta. For this attempt, I actually partially cooked the Pancetta, but I would say you could try putting it on raw and if you feel it needs a bit more cooking at the end, you can pop the broiler on and finish them off. I just like them a bit more tender than how they turned out for me…. Heat a small saucepan and add butter. 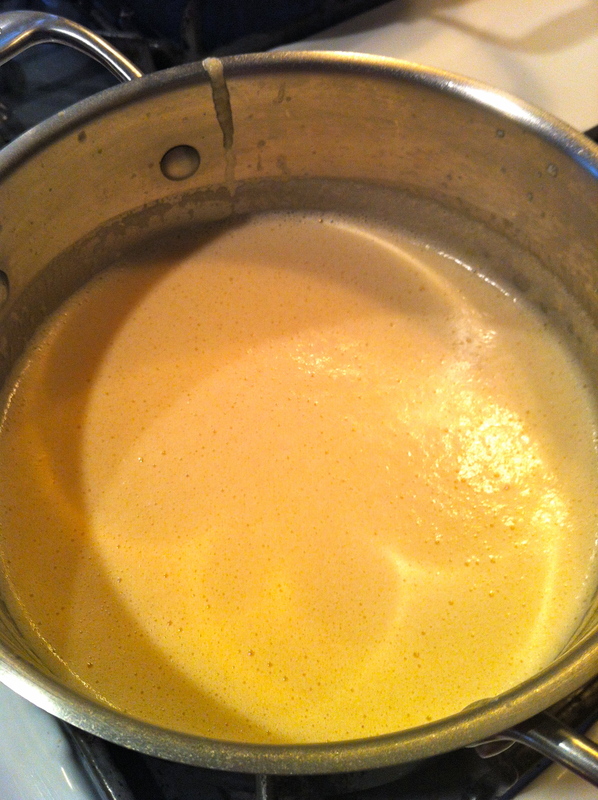 Once the butter has melted and is starting to sizzle, whisk in the flour to create a Roux and continue cooking & stirring until the mixture is golden in color. 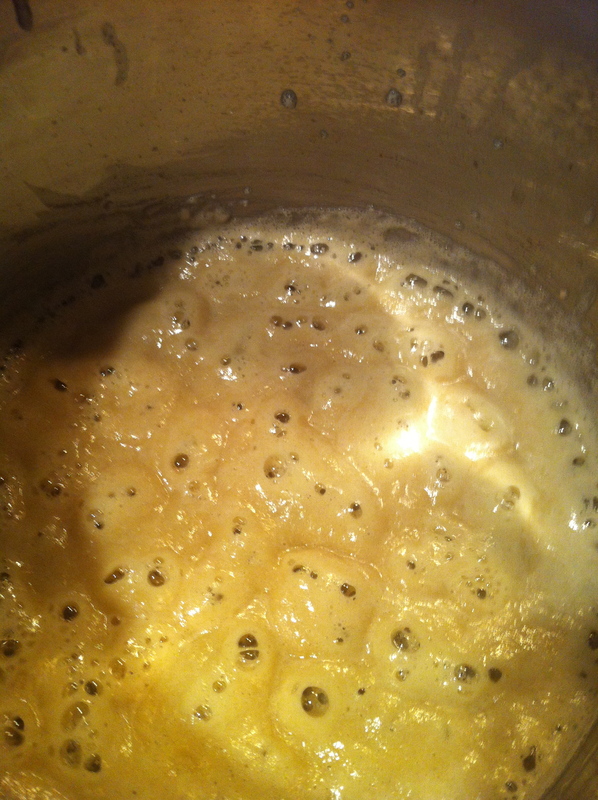 Add milk and beer to mixture and continue whisking. 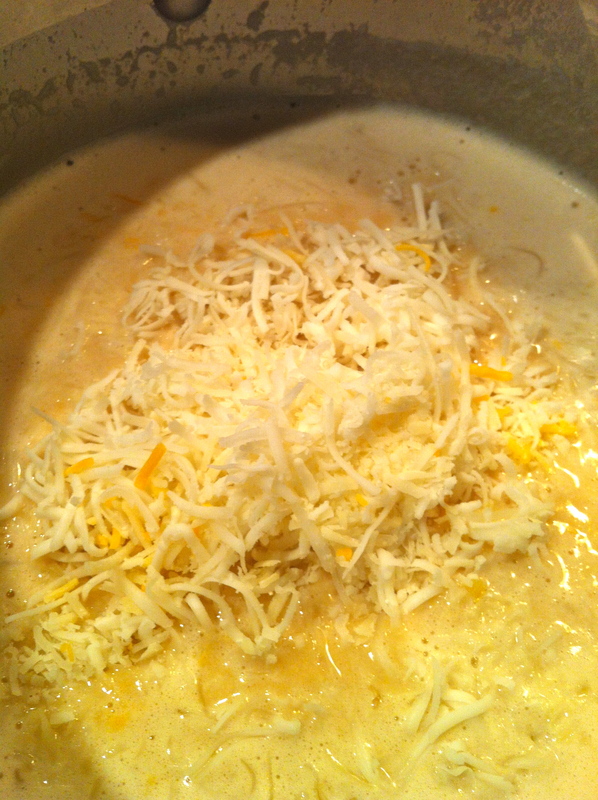 Add the Cheddar & Gouda cheeses and stir until melted. Turn heat down to low and and continue to stir until mixture thickens. It won’t thicken like normal Mac & Cheese, because of the Beer, but it will a bit. Turn off heat and add the Truffle Oil, Black Pepper, Paprika and Nutmeg. I was SO excited how this turned out! As my husband put it best, you could taste all of the flavors, from the beer to the Truffle Oil, to the Pancetta. I am glad I didn’t use bacon (yes, I said that) as that might have been a bit overwhelming. However, next time, I might add some Cream Cheese or a higher fat content milk so it would be a bit more smooth & creamier. 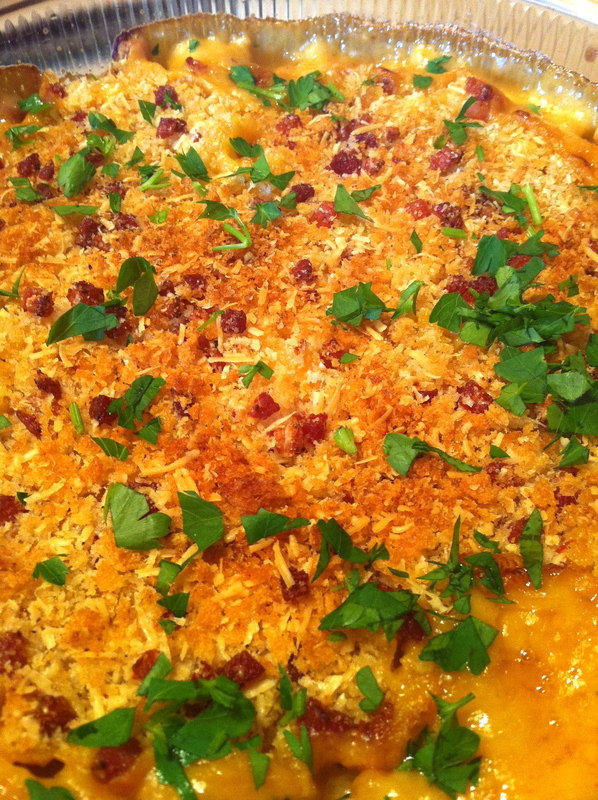 And maybe some fresh herbs…or Blue Cheese…or….. Oh geez, there is so much you can do with Mac & Cheese!!! 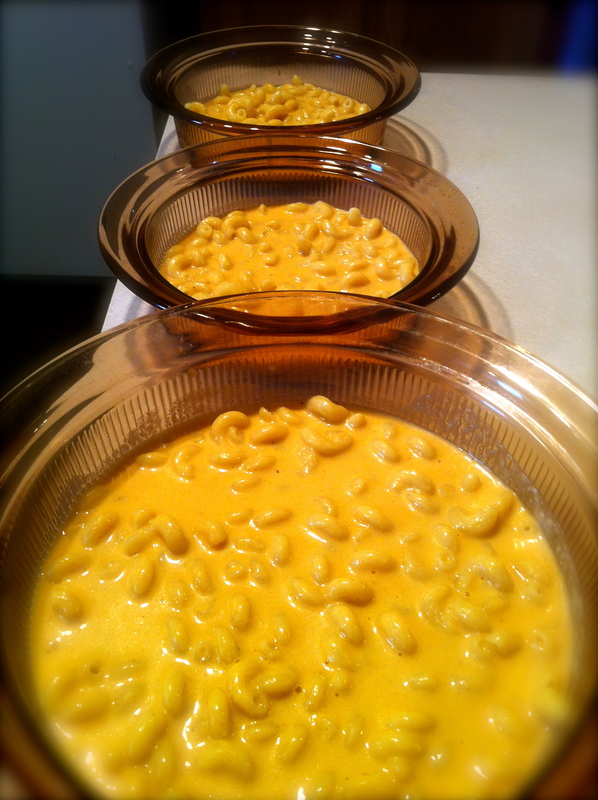 Anyway, I hope you’ll give this Beer Mac & Cheese a shot and join me next time for Beer for a Year, month seven! This was a great Mac and Cheese I think Bacon would have been a great add but it was yummy with out it too! Thanks for sharing with me Shawn! YUM! 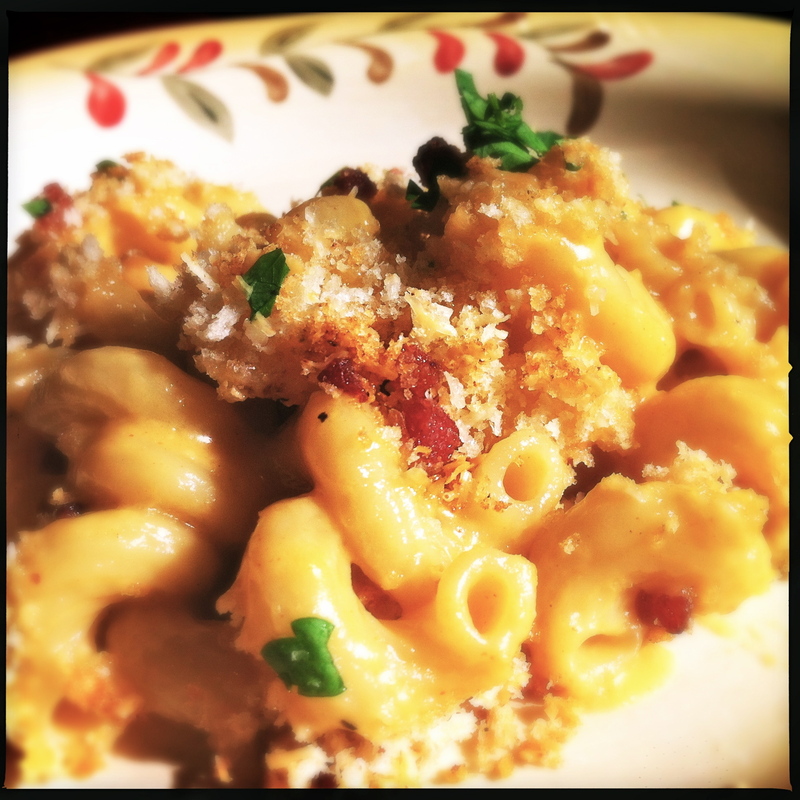 You know I love mac and cheese add Beer and Pancetta oohhh….